Welcome to the NEW Inside African Art! 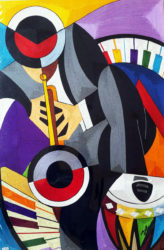 HALF OFF ALL PAINTINGS BY PREMIER ARTIST JOEL NGOKO! FIRST COME, FIRST SERVED! DON'T WAIT! The Only 100% Oil on Canvas Artist - the Highest Quality Original Paintings! 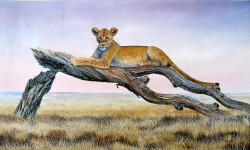 "I have sold many of my wildlife paintings to so many parts of the world since I started my career as an artist. 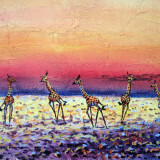 I believe my wildlife paintings are among the most attractive to many of my customers. As a specialized artist I have traveled widely in Kenya’s wildlife reserves. Art is a great challenge!" Nothing says 'Tanzania' more than the exquisite beauty of TingaTinga art. Artists span from Daudi, the son of the Edward, the father of TingaTinga, to many of the artists from the UK TV show TingaTinga Tales. Our 18th Anniversary Special is going on now! Special pricing is in effect for the month of October! See the discount and how to take advantage of these incredible prices, for incredible original silk thread art! See the wonder of Yeb! Inside African Art's website platform for the past 17 years became obsolete. This forced me to build a new website - this one. Rest assured that IAA is still run by the same people and in the same way - it's just a different look! Since the inception of this website in 1999, Inside African Art has been devoted to the promotion, exposure and marketing the talents of African artists. We showcase their skills while providing them with an alternative income. From you to the artists - via this website. Simple: Win-Win-Win: You 'Make an Offer' and receive a wonderful original African painting at a reasonable price, the artists receive the financial benefits, and I pocket enough to keep improving this website. Win-Win-Win! What is 'Make an Offer'? Because I lived in East Africa for 20 years, I know of only one way to buy anything – the African way, by bartering – no fixed prices! I came up with this idea and incorporated it into my website in 1999, as a great way to engage the audience, as well as have you actually think about the value of the paintings – to yourself, as well as the artists who created them. We all look at art differently! Read more about 'Making an Offer'. Where are you? How long will a painting take to get to me? Well, we're no longer based in Nairobi, Kenya. Me and my people recently moved to just outside of Orlando, FL, USA. The paintings you see on this website are here with us. On confirmation of payment I zip them over to the post office, usually the next business day, and they are on their way to you - wherever you are. I've shipped over 4,000 paintings to practically every country on the planet and (knock on wood), have yet to lose even one painting. How do the artists benefit? My family and I travel quite a bit to and from Kenya to visit family and friends. Every trip we take is also a business venture as our days are filled with visiting with artists, catching up, drinking tea (or a beer), and exploring their latest artistic creations. By the end of the day, I have a some fantastic paintings and the artists have some some funds to put food on the table of their family, pay for school and medical fees, and ensure there's a roof over their heads. Some of the artists on this website I've known for more than 25 years! In that time some of the artists have unfortunately passed away (Shiundu, Thairu, Mbugua, Kolii Paul), while others have thrived and continue to nurture their passion. It is our mission to continue to support these artists through it all, and as their skills evolve. Can I request a custom painting? Absolutely! Since I am in touch with many of the artists frequently, I can request a custom painting per your specifications. Artists like N'gan'ga Ndeveni, Patrick Kinuthia and Martin Bulinya specialize in this type of thing and have fulfilled many special orders. As well, Yeb can create just about anything from a photo, especially incredible portraits in silk thread. It never hurts to inquire - you never know! Go to each of their pages to see an example! 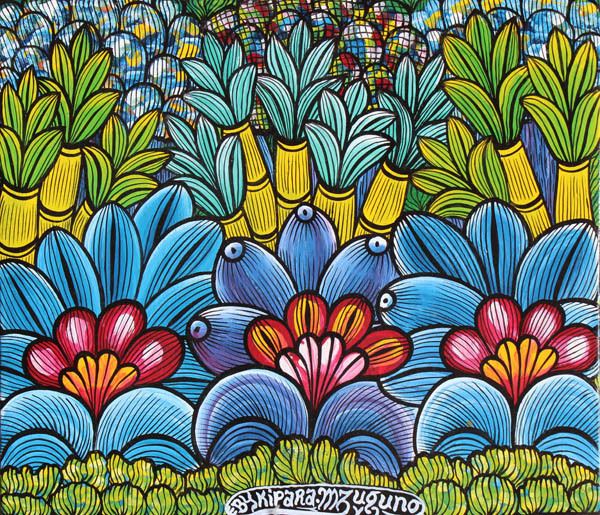 There's no painting style as vibrant and dynamic as a TingaTinga painting. 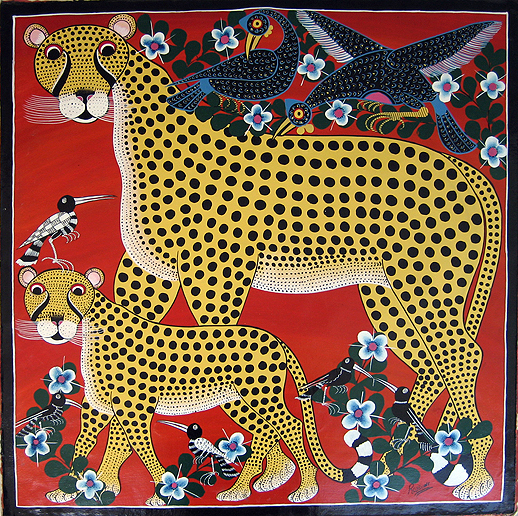 Painted with high-gloss oils usually used on bicycles, TingaTinga paintings are bold and vivid, reflecting both the artists and life in Tanzania. 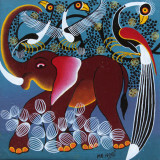 We are overflowing with TingaTinga paintings, with over 100 in stock. Check them out! Art reflects culture, but it also can reflect emotion! If someone asked you to paint a picture of say, joy, how would you even begin? Characterized Maasai women dancing without inhibition to the beat of music only they can hear. 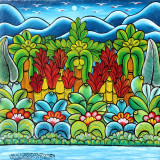 The paintings of prolific artist Martin Bulinya reflect true joy as well as many other emotions. Have a look! A test of observation and painting prowess, it's difficult not to consider realistic wildlife painting a true challenge. Spending days in the Maasai Mara merely to observe and sketch in an effort to refine their skills. 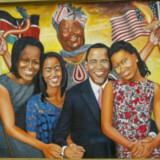 Oil painting artist like Joel Ngoko and acrylic artist Wycliffe Ndwiga are some of the best. June 2018 - They're unique and rare! 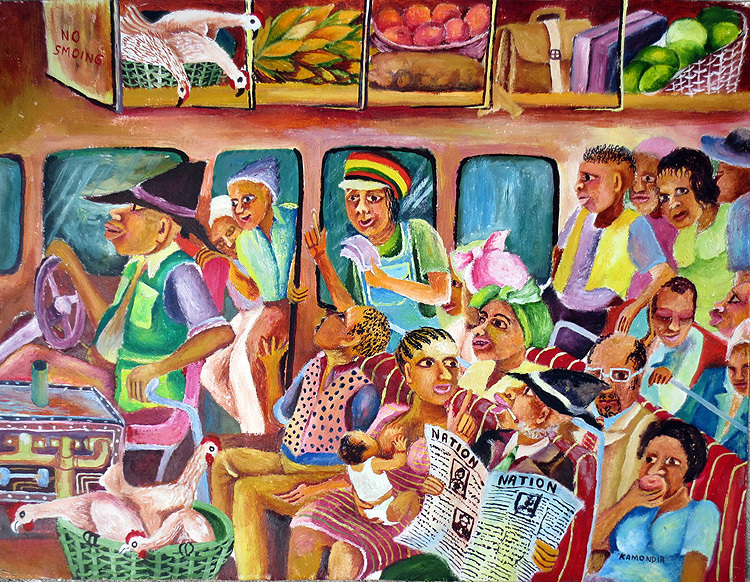 Ndichu Njuguna's paintings are hard to find - but you can find them here! March 2018 - Good news for 'twitchers' - New Paintings by premier ornithology artist Omari Idi have been added! March 2018 - New Paintings by watercolorist Joseph Thiongo added! February 2018 - New Paintings by Ng'ang'a Ndeveni added! January 2018 - New Paintings by Joseph Juma added! 3. Original photo in silk thread! Noel Kapanda – The Real George Lilanga? Comments, Ideas, Suggestions? Contact Me - For any reason! 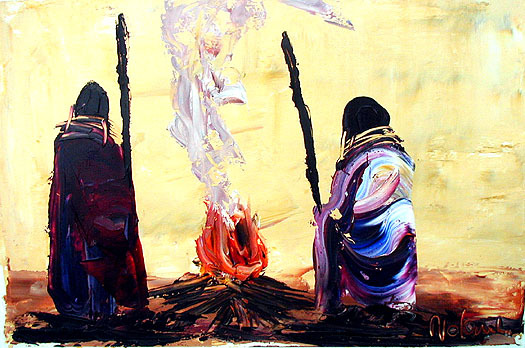 Unlike other websites, the beneficiaries of paintings sold on Inside African Art are the artists themselves. The money they make from paintings sold on IAA help to provide fundamental security (food, medicine, education) for their families. Nothing matters more. Thank you. © 1999-2018 Inside African Art, All Rights Reserved. No portion of this site may be reproduced or duplicated without the express permission of Inside African Art.